Onderstaande oproep is voornamelijk gericht aan mensen uit de Verenigde Staten, maar niets houdt personen die het Engels voldoende beheersen tegen om deel te nemen. De Nederlandstalige Wikipedia is er nog veel erger aan toe dan de Engelstalige versie, dus ook daar is nog heel wat werk aan de winkel! Have you ever wondered why there are few instances of detailed entries on women and gender studies, disability studies and on people of color on Wikipedia? Wikipedia itself has noted its own systemic bias – Wikipedians are by and large privileged, educated Anglophone males who might not consider these fields worthy subjects to annotate. According to the Wikimedia Foundation’s study in 2011, only 13 per cent of countributors to the site were female. Claire Potter has pondered about this in a recent article titled “Prikipedia? Or, Looking for the Women on Wikipedia.” If this concerns you, now’s your chance to rectify this! In celebration of Women’s History Month and WikiWomen’s History Month, groups across the United States are organizing both virtual and in-person meet-ups to edit Wikipedia to include more perspectives on women and people of color on Friday: #tooFEW - a feminist Wikipedia edit-a-thon! Originally conceived of as part of a virtual way to connect the upcoming THATCamp unconferences on feminism, there are now widespread events everywhere. If you can’t find a way to physically get to one of the edit-a-thon parties, please consider just jumping in, editing entries and following on the Twitter conversations using the hashtag: #tooFEW. 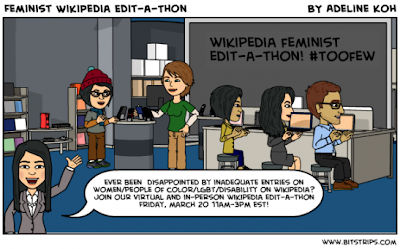 Join us virtually by doing your work during our edit-a-thon. If you’re on Twitter, send out a Tweet that includes the hashtag #tooFEW to let us know you’re out there. We’ll be live editing from 11am-3pm EST, Friday March 15. - Students — Do they need extra credit? Can this be a class project? Are you learning about some really cool people in POC/Trans*/Queer/Women’s History that don’t have wiki pages or have pages with bad information? You can fix it! - Friends — Do you know other folks who should know about this? Please spread this information to activists you know, faculty, etc. Everyone is welcome! - Organizations — These edit-a-thons work best with lots of folks working on specific things. Do you know orgs like INCITE or SONG that know specific types of folks who should be added to Wikipedia or projects folks should know about? Too swamped and don’t want to login to Wikipedia but would like to contribute? Add your idea to this Google doc. We look forward to seeing you on Wikipedia and the hashtag #tooFEW!